It was during my research that I discovered a whole new world of knee pillows. While its common knowledge that sleeping or sitting on the bed with a pillow in between or under the knees is ideal, I always assumed that I can just use any sleeping pillow and I’m good to go. Boy, was I mistaken? Knee pillows were created to improve the comfort of the legs and knees. Whether it’s used for sleeping or lounging on the bed, the goal is proper blood circulation leading to a pleasurable sleep or rest. First, let’s focus on the relationship between sleeping and knee pillows. The ideal sleeping position is on the side facing left as it stimulates proper blood and digestive circulation. Even though this position is the most used and recommended, it is still not void of complications such as hips and spine misalignment. Knee pillows not only further enhance blood circulation across the body, but they also ensure that our posture is correct while we sleep. Using a knee pillow relaxes our nerves and muscles, thus leading to a more restful sleep. Knee pillows are also a great accessory to have while relaxing in bed. For this, it would be best to use a wedge-shaped or body pillow. Sit up, put the pillow under your knees, grab a book and you’re good to go. Using a knee pillow on this occasion ensures proper blood circulation because let’s face it when we’re too engrossed in a book, we forget to change positions or even move! Wanna up your lounging game? Add a husband/reading pillow to your arsenal and you will have achieved the top level of relaxing in bed. Have you ever seen swimmers during training with a pull-buoy in between their legs? That’s what a typical knee pillow looks like. It is perfectly contoured to fit in between the knees. Furthermore, it is meant to be as discreet as possible so the average weight of knee pillows is half a kilo or less. Hourglass: the most common among the shapes, an hourglass knee pillow is contoured to the natural curve of our knees and legs, which adds comfort and ease of use. 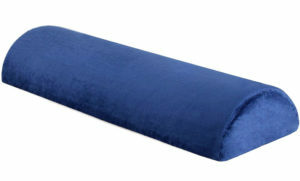 This type of knee pillow is best used for side sleepers because it prevents the legs from touching each other. Personally, I hate it when the bones at the side of my knees hit and rub against each other. 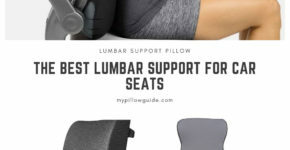 Using a knee pillow creates a cushioned barrier that keeps the legs apart plus it moves with you as you change from side to side, keeping the hips perfectly aligned. Wedge: these pillows come in a triangular or half-moon shape and are suited for back sleepers to be placed under the knees for added comfort. Many find sleeping with a wedge-shaped knee pillow below both knees very relaxing. With the lower body elevated, there is better alignment and improved blood circulation in the legs. I’ve actually stood in front of a mirror and studied our natural shape. It makes sense for back sleepers to elevate their legs because there is something called our buttocks that hinders alignment when we lay on our backs. Without a pillow under our legs, our lower bodies experience more strain by being stretched out thus causing leg and lower back pains. Body: body pillows are caterpillar pillows. They are wide and long, usually the same height as an adult. Body pillows can be folded and bent to go in between the legs, back or sides, depending on preference. Even though this is not usually meant to be used solely for the knees, a lot of people actually rely on body pillows for this purpose. Knee pillows are typically made from shredded or one whole piece of memory foam or polyfoam. Their covers are made from cotton or synthetic fibers such as polyester and/or rayon. Knee pillows aren’t made to be soft and cuddly because they are meant for support, so they should have medium-firm to a firm consistency. 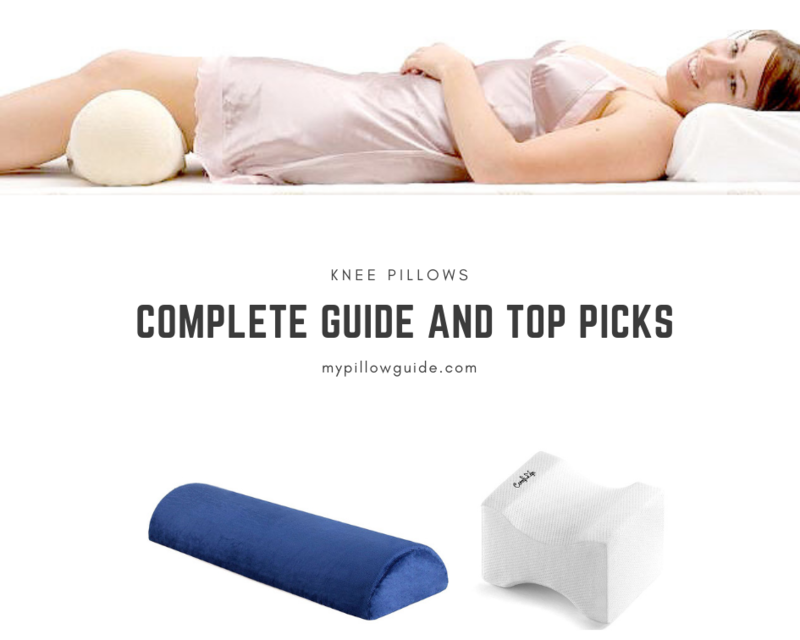 Tips for choosing the Knee Pillow for you! Choosing the best pillow comes down to preference, body type, level of activity, current health issues (if any), budget and other factors. In no particular order, let’s start with pillow budget. The majority of knee pillows today are priced at $30 or less with some specialty models being a bit more expensive. Knee pillows are relatively cheap therefore our main concerns should be more focused on quality and comfort. The thickness of a knee pillow you will be purchasing is relevant to your weight. Generally, heavier people should get thicker knee pillows while more petite body frames prefer thinner ones. Hourglass shaped knee pillows for side sleepers and wedge-shaped ones for back sleepers. For stomach sleepers (yes, it is a thing), body pillows are usually picked because it is the most comfortable one to use for that position. Are you a hot sleeper? Most pillows sold today are made of memory foam which naturally absorbs more body heat. This may be an issue for people who feel hot while they sleep. Try to avoid thick covers made of synthetic fibers that tend to heat up and go for cotton material if you sleep hot. If you’re a kicker when you sleep then there are knee pillows with stretchable straps to wrap around your legs so that they stay attached when you move around at night. For those who want to make sure that a knee pillow is what they need, some pillows offer sleep trials. You can test the product for a limited time and it can be returned if it doesn’t meet your requirements. Others also offer a satisfaction guarantee so you can return your pillow anytime and get a refund. Warranties are another thing to look out for when choosing a pillow. If a pillow comes with a 100% satisfaction guarantee, it usually cancels out the warranty. Otherwise, most pillows are covered for its entire lifespan. A good night’s sleep. Pillows are heaven-sent inventions that were meant to make our sleep so much better. As humans, sleeping and resting are our ways to recharge, much like plugging an electronic device to its charger and socket. Pain, pain go away. Have you ever sat in one position with the wrong posture and felt your muscles cramping and shouting when you stood up? The same applies to sleep with bad posture. It is much worse in this case because we don’t have conscious knowledge that we are sleeping in a position that will cause multiple pains when we wake up. Having a pillow in between the knees is a quick, affordable and easy way to avoid back and leg pains. As I’ve mentioned earlier, using a knee pillow aligns the legs into their ideal positions, thus avoiding any negative effects. Spine and joint health. For side sleepers, a firm knee pillow also prevents the upper leg from pulling the spine out of alignment. Imagine sleeping on your side with your upper leg putting a lot of weight on your lower leg, or sleeping on your back with your legs outstretched, do you share the stress your lower leg or back leg areas feel? Sleeping without a pillow in between or under the knees causes the joints and muscles to tighten or overstretch which are not healthy choices to make. 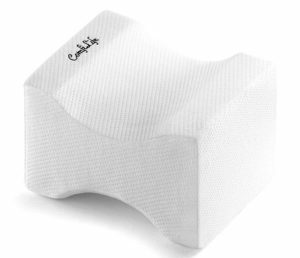 I’ve done my research, I’ve read countless reviews, I’ve pestered my friends if they have knee pillows and asked what it was like, and I was able to narrow down my long list (yes, for something so simple, there was surprisingly a lot to choose from) to the top three. With over 4 thousand reviews in Amazon and a rating of 4.5 stars, this pillow is the holy grail of knee pillows. For those with hip issues, even those that have recently gotten hip replacement surgery, swear by the effectivity of this product. Those with difficulty in sleeping have found great relief through this pillow. The knee pillow is not too bulky, so rolling over to the other side with something in between your legs is not an awkward feat. Prepare for some separation anxiety when the pillow leaves your knees in the middle of the night because continued use will make your body heavily dependent on it; much like a kid and his comfort blanky or teddy. Once your body knows the benefits this pillow has, it will automatically add it in its list of “things it cannot sleep without”. The only regret people have about this pillow is not making the purchase sooner. Next up is a hot-dog pillow. I don’t know about you, but growing up, I loved my sausage roll. To the point that my mom would have to pull it away from me to get it cleaned because of the musty smell it was developing. Turns out, this type of pillow would turn up again into my life even as an adult. Who doesn’t love a multipurpose product? People have used this in other locations such as the car, couch or an office chair. The lumbar pillow gave much-needed support in any location. As it works so well in many positions, you might have to purchase a few so that one can go under the neck, the knee, and ankles. Side sleepers have also found comfort using this pillow. They hug it while sleeping and it helps in hip and spine alignment. 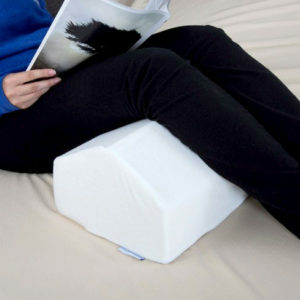 Stomach sleepers, usually the hardest to please when it comes to supporting pillows, have also praised this knee pillow. It would seem that I cannot get enough of the pull-buoy shaped knee pillows. I’ve picked another best seller with a few more perks. The following pillow has also garnered almost 900 reviews on Amazon with a 4.5-star rating. Expect a bonus of 2 pairs of premium quality memory foam earplugs that boasts of a Noise Reduction Rating (NRR) of 33. Product Dimensions: 10.5 x 6 x 8 inches in size and 1.4 lbs. in weight. This pillow might be bulkier compared to its counterpart mentioned earlier but it works even better for bigger body frames. Converted users also commented that the size is perfect in stopping both legs from hitting each other when sleeping. It would be important to note that a common review about this product is that it doesn’t come with a smell that is usually attributed to memory foam. For those of you who have a nose with canine keenness (no offense because I am equally as picky when it comes to scents), this is the knee pillow for you. To comment on its orthopedic validity, this pillow is for real. Those with arthritis, bursitis, joint, and sciatic nerve pain have discovered much relief as early as two weeks of using the pillow. My final thought at the moment is that I’m getting scared that my house will one day become full of pillows! I am usually not the type to be swayed by advertisements, over-zealous sales agents or home shopping network products, but…it might be time for a change, what do you think? Rest assured that after this long post, you will not be hearing of any more stories about my hubby-to-be experiencing not-so-much-age-related body pains because I am ordering one (or if you know me well, two) online immediately. Want to address two birds with one pillow? Then add a neck pillow with your knee pillow. It just so happens that I’ve also done my research for that. After all, who doesn’t want a blissful sleep with no pains and aches come morning? Ta-ta for now, my pillow friends! Happy holidays everyone—wishing you and your loved ones and friends the greatest joys of the season. Hope to see you all soon here at My Pillow Guide! Hey there. I really appreciate the informative article and your recommendations. I have a serious back pain at this moment and it is caused by bad posture at work and my sleeping pose. I am using memo foam pillow and it really helps with removing the heat and absorbing it. However, I’m going to get a knee pillow. Comfi Life Pillow looks like the perfect fit for my needs because of the back pain. Price is fine and the reviews are even better. I think I have my winner. Thank you for proving me with valuable info. I happen to be a side sleeper and from all what I read ,I can see the important of knee pillows to our health. I am actually pregnant and most times I don’t enjoy my sleep because of pains all over my thighs and ankles, I feel this should be able to help me out. I am going to give a trial and see the effect. But I hope it won’t have any effect on my baby? I really appreciate this beautiful write up, is really educative! Great job! !